Skip Bins South of the river and Skip Bin Hire Northern Suburbs with affordable prices. Easily ORDER ONLINE now for AbleTek Mini Bins excellent service. Perth homeowners can take advantage of our fast service and reasonable mini bins hire prices for home renovations, garden clean ups or business needs. Our size 2 mini bins are 1.8m in length, 1.4m in width and 1m in height for the convenience of small and compact skip bins in tight access or awkward areas on any property. We also provide two larger sizes, size 3 and size 4. Our standard size 2 mini bins have no weight restrictions and our most popular skip bin. They are great for all purposes and awkward access areas. Our size 3 mini bin is based on our standard size but has access door fitted and high sides for that extra rubbish. Great medium sized skip bin. 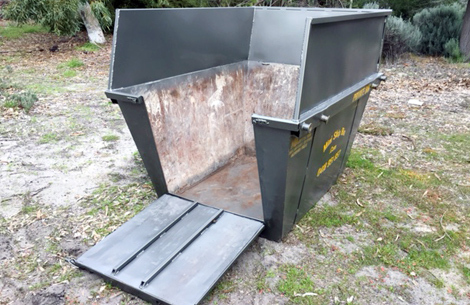 Our size 4 mini bin is based on our standard size but with high sides for the extra capacity. Great for Bulky and Green waste. No good for bricks and concrete. Yes we can. Drop off and pickup your bin on the same day, or you may prefer to have your skip bin delivered one day, and picked up the next day. Our mini bins can be hired for as long as you need when book and pay online. The mini bins will be picked up on your nominated pickup date. For an earlier pick up, just send us a text or email. Perth mini bins hire prices include GST, delivery, pick up, tipping and all other charges. Delivery area is within 25 km of Perth CBD. The mini bins will be emptied into a compactor truck or a full size skip bin and transported to a waste management facility. 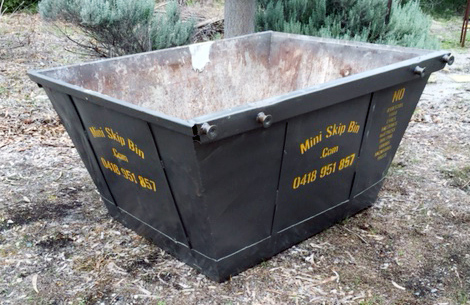 Mini Bins work with various trades people, landscapers, kitchen and bathroom renovators. We are efficient, friendly and professional at all times to ensure your customers are always happy. Ask us how we can help your business. No more than 2 cubic metres of sand, concrete or bricks are allowed in any of our skip bins. These guidelines are in place so that we are able to maintain our environmentally friendly approach to waste management. If any of the harzardous waste items are found in our mini bins, the bin will be emptied on site. We deliver mini bins to all suburbs in the Perth metropolitan area within 25km of CBD as a part of our professional service. If you require the skip bin hire for a suburb that is outside the 25km from the CBD range, we can definitely provide your service however a travel fee will apply. If you’re unsure if whether or not we will deliver mini bins to your suburb, just give us a call on 0418 951 857 and we’ll let you know. Bins are delivered Monday to Friday. An option to order a weekend delivery is available online for a fee. If you select a delivery date for mini bins hire on a WA public holiday or a weekend, we will deliver the mini bins either the day before or the day after the date selected if the delivery fee has not been paid. Mini Bins have two locations in the metropolitan area to be able to provide fast, efficient and cost effective skip bin hire with ease. Our Skip Bin hire in the Northern Suburbs is located in Bayswater, servicing Joondalup, Malaga, Wangara, Midland and surrounds. Our Skip Bin services South of the River is located in Banjup servicing Canning Vale, Armadale, Baldivis, Fremantle, Rockingham and surrounding suburbs. So you don’t know how long the tradies are going to take? What if the brick paver gets rained out or your tiler has been delayed in completing your renovation. No worries, Yes We Can. You can book the bin until the job is done online. 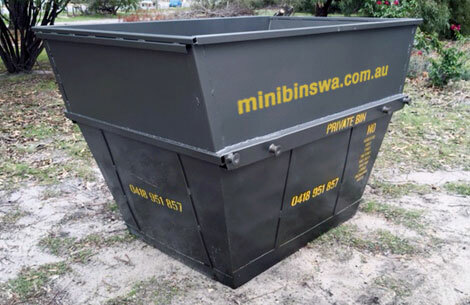 If you are looking to hire a Mini Bins Perth for longer than 7 days – yes we can.